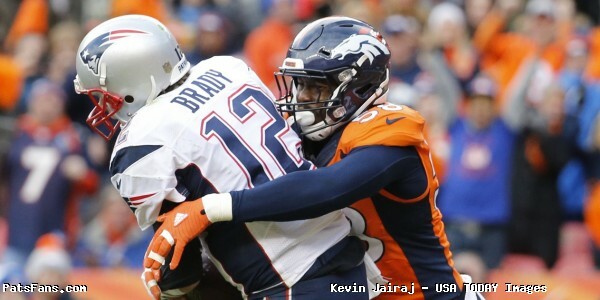 Patriots – Broncos Keys, Who Has the Razor’s Edge? The New England Patriots head out to the Mile High City as they take on the Denver Broncos on Sunday afternoon. Kickoff is scheduled for 4:25 p.m. This week’s game will be broadcast by CBS and can be seen locally on WBZ -TV Channel 4 in Boston. Jim Nantz will handle play-by-play duties with Phil Simms as the color analyst. Tracy Woolfson will work the sidelines. 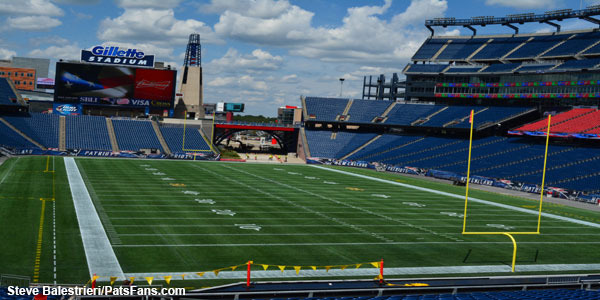 The game will also be aired on the Patriots flagship radio station 98.5 The SportsHub with Bob Socci and Scott Zolak on the call, produced by Marc Cappello. The Patriots (11-2) beat the Ravens 30-23 on Monday Night Football. 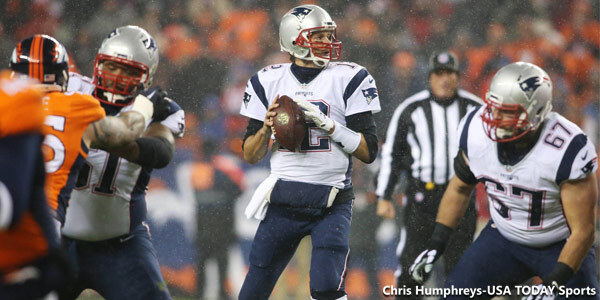 Tom Brady threw for 406 yards and three touchdowns as the Patriots rolled up nearly 500 yards of offense. Shea McClellin blocked a punt and LeGarrette Blount topped the 1000-yard mark for the season and picked up his league-leading 14th rushing touchdown. The Broncos (8-5) lost in Tennessee to the Titans 13-10. The loss was Denver’s third in the last six games and now they face New England, Kansas City, and Oakland in their final three games as they try to make the playoffs. The Patriots and Broncos are meeting for the 52nd time since 1960 when the AFL first opened. No place has been tougher to win for the Patriots since they entered the league as they’re just 9-21 on the road. The series has been dominated in recent years by the whoever is playing at home. The home teams have won 9 out of the past 10 games with the only victory on the road was the Pats in December 2011 defeating the Tim Tebow led Broncos. Denver took both games last year, a 30-24 overtime win in Mile High in November and 20-18 in the AFC Championship Game, where a missed extra point by Stephen Gostkowski turned out to be the difference in the teams not going to overtime. This entry was posted in NFL Commentary, Patriots Commentary and tagged 2016 NFL Season, 2016 Patriots season, Aqib Talib, Bill Belichick, Chris Harris, Chris Hogan, Danny Amendola, DeMarcus Ware, Demaryius Thomas, Denver Broncos, Dion Lewis, Dont'a Hightower, Emmanuel Sanders, Gary Kubiak, Jabaal Sheard, James White, Julian Edelman, LaGarrette Blount, Malcolm Butler, Martellus Bennett, New England Patriots, NFL, Patriots, Patriots edge rushers, predictions, Rob Ninkovich, Tom Brady, Trevor Siemian, Trey Flowers, Von Miller on December 16, 2016 by Steve Balestrieri. The Patriots go back out on the road and travel to their own house of horrors when they take on the Denver Broncos at 4:25 p.m. on Sunday. The Patriots obviously never cared for the thin air of Denver as they’ve traditionally played some of their worst football when visiting the Rockies. They’re hoping to change that trend with a big win this week. The Patriots (11-2), defeated the Ravens 30-23 on Monday Night Football. Although they dominated Baltimore thru much of the game, a pair of costly special teams’ gaffes allowed Joe Flacco and the Ravens to get back into the game. However, Tom Brady shook off a slow start and was brilliant. He passed for 406 yards and three scores, his last a 79-yard clinching beauty to Chris Hogan to put the game away. The Patriots kept a three-game lead of the Miami Dolphins who beat Arizona but lost QB Ryan Tannehill, at least for a few weeks. The Pats own the top spot in the AFC with a game lead over the Kansas City Chiefs and Oakland Raiders, both 10-3. The Patriots can seriously hurt Denver’s playoff chances with a win on Sunday. The Broncos (8-5), are struggling right now, having split their last six games following a maddening trend of win-loss and are in danger of missing out on the playoffs. Denver’s last three games of the season are at home against the Patriots, at KC and then home against the Oakland Raiders. No one has a tougher schedule down the stretch. Broncos Defense Has Had to Carry the Team: Denver’s defense which carried them to a Super Bowl win in 2015, is still incredibly tough against the pass and has carried the team thru a somewhat difficult season this year. The Broncos are the #1 defense against the pass allowing just 183.5 yards per game. The pass rush with bookend edge rushers Von Miller, DeMarcus Ware and Shane Ray are second in the league in sacks with 38. They have more interceptions (12) than touchdowns allowed (10), through the air. With an offense that has sputtered at times this year, the defense, while still top notch, has developed some trouble spots. And although their pass defense outside with Aqib Talib and Chris Harris is outstanding, there are areas that opponents, (the Patriots), may be able to exploit. Check back with us later today for our All-22 film study on how the Pats may decide to attack. Tom Brady and the Patriots passing offense will face their biggest test of 2016 on Sunday and they’ll need to get everyone involved if they want to come away with the victory on the road, where the Patriots are 6-0. Denver Can Be Run on This Week: The Broncos defense has taken a big step back in their rush defense from a year ago. In 2015, Denver opponents rushed 408 times for 1337 yards and only 10 rushing touchdowns for an average of just 3.3 yards per rush. In 2016, Denver’s opponents have rushed 390 times for 1654 yards with 12 touchdowns and a much higher 4.2 yard per rush average. Last week, the Tennessee Titans controlled the line of scrimmage and rushed for 180 yards in the 13-10 win in Nashville. The Broncos were third against the run in 2015, but have fallen all the way to 29th this year allowing 127.2 yards per game. This week should see a heavy dose of LeGarrette Blount and Dion Lewis in the running game for the Patriots. With linebacker Brandon Marshall hurting with an injury, he may miss this week’s game. That would be a significant loss for Denver, especially considering the struggles going on in the rush defense. Siemian Still Learning On the Job: The Broncos entered 2016 with questions at the quarterback position as Trevor Siemian and rookie Paxton Lynch didn’t have a heck of a lot of experience. Siemian’s numbers aren’t bad, he’s completed 61.2 percent of his passes with 230 completions of 376 passes for 2730 yards with 16 touchdowns and seven interceptions for a QB rating of 89.2. Denver is currently 19th in passing offense in 2016. Siemian has some outstanding weapons to use in the passing game, with Demaryius Thomas and Emmanuel Sanders and has found youngster Devontae Booker out of the backfield as well. Thomas leads the team with 76 catches for 925 yards and five scores while Sanders has 75 catches but leads the team in yards with 958 with five touchdowns. Without the deep passing game that hallmarked the Broncos offense the past few years, Siemian is capable of moving the ball and garnering yardage, but can he put up enough points to keep up with playoff teams? The Patriots may get after him a bit and try to disguise some coverages to make him hold the ball longer this week. Running Game Has Struggled: The Broncos running game, once again a strength down the stretch in 2015 has left them wanting this season. Denver’s running game is mired in 27th place averaging just 93.8 yards per game, down 10 places from 2015. With C.J. Anderson lost for the year, Denver has turned to Devontae Booker as their bell cow running back. He’s been underwhelming for the most part, gaining just 511 yards on 149 carries with three touchdowns. He’s averaging just 3.4 yards per carry. The team recently brought in Justin Forsett who was jettisoned by Baltimore earlier this season. Forsett played for Gary Kubiak in Houston and it is hoped that he’ll help jumpstart the moribund running game. The Patriots have played better defense lately by being able to make their opponents one-dimensional offensively and it started with shutting down the run. With Alan Branch and Malcom Brown inside, there’s no reason to think they can’t do so again this week. Special Teams May Play A Big Role: The Broncos special teams’ have struggled at times with their consistency in 2016, something that may come into play on Sunday. Who can forget the muffed punt last season? With the Patriots holding a two-touchdown lead, Chris Harper muffed a punt and it sparked a huge Denver comeback which culminated with an overtime win for the Broncos. Kicker Brandon McManus has been perfect inside 40 yards this season but beyond that he’s just 9 of 13. Rookie punter Riley Dixon has averaged 41.2 yards net per punt. Rookie Kalif Raymond provided a spark in the punt return game against the Jaguars. With the Patriots kicking game solidified in recent weeks, this is an area that the Patriots must feel good about. But the continued struggles for Cyrus Jones will have them searching for answers this week. Once again this year, the special teams play a big role deciding which of these two teams comes out victorious. This entry was posted in NFL Commentary, Patriots Commentary and tagged 2016 NFL Season, 2016 Patriots season, Bill Belichick, Chris Hogan, DeMarcus Ware, Demaryius Thomas, Denver Broncos, Devontae Booker, Emmanuel Sanders, Gary Kubiak, Malcolm Butler, NFL, Patriots, Patriots edge rushers, Tom Brady, Trevor Siemian, Von Miller on December 15, 2016 by Steve Balestrieri. Is the NFL’s Pendulum Swinging Back to the Running Game? The NFL is a passing league and it is driven by the quarterbacks. With the plethora of talented passers and athletic receivers in the league, it has led to an explosion of passing yards, touchdowns and offenses that love to spread out defenses and find mismatches. That has led to smaller, faster and more athletic defenses that have to try to keep up with these offenses. Denver’s defense is a prime example, a very athletic, blistering fast unit that uses speed to overwhelm their opponents. But the NFL is always evolving and the league is trending back to being more run based but at a bare minimum, it is going to be much more balanced in terms of offense. A quick look at the final eight teams that rounded out the NFL’s season from the Divisional Round thru the Super Bowl shows that for the most part, teams that ran the ball well were the ones standing in the end. All four of the teams from the NFC were in the top 12 of rushing. Carolina was the #2 rushing team in the NFL averaging 142.6 yards per game. Seattle was the #3 rushing team, even without Marshawn Lynch down the stretch averaging 141.8. Arizona came in 8th with 119.8 yards per game and Green Bay rounded out the NFC at #12 with 115.6 yards per game. Over in the AFC, Kansas City was the #6 rushing team in the NFL averaging 127.8 yards per game. Pittsburgh came in 16th with 107.8 yards per game. But they lost LeVeon Bell after only six games in 2015 with him serving the first two games of the season on a suspension and then him going down with a season ending injury, tearing an MCL in Week 8. Denver was right behind Pittsburgh in 17th place in the league averaging 107.4 yards per game. But that number needs to be looked at closer. After Peyton Manning was sat down, and Brock Osweiler took over, Gary Kubiak finally installed the running game as he envisioned it with the QB under center. The results were startling. In the last seven games of the season, Denver averaged 134.9 yards per game, which would have put them right around 5th/6th place over the course of a season. Only the New England Patriots were the anomaly in the final eight, rushing for a paltry 87.8 yards per game, 30th in the NFL. Their success had more to do with the ability of Tom Brady than anything else and why they made it the conference championship. It also isn’t surprising that the league’s top five scoring teams (Car, AZ, NE, Sea, Pitts) are also on this list, again only the Patriots are the wildcard with the vast onus being on the passing game. Kansas City finished with the 9th top scoring team in the league. Does this mean that the NFL is going back to the 4 yards and a cloud of dust days? Hardly, as long as QBs like Brady, Aaron Rogers, Drew Brees, Ben Roethlisberger et al. are under center teams are going to throw the ball and do so very well. But to combat the fast nickel and dime defenses that teams are playing more and more with five and six defensive backs on the field, teams are going back to more of balanced run based approach. It keeps the downs and distances manageable and when facing third and short, teams that run effectively have the option of mixing things up and keeping the chains moving. The NFL is a copycat league, with the success of both Denver and Carolina having very good running attacks and fast, athletic defenses, look for the other teams in the league trying to duplicate their success. The age of the mobile, big-armed QBs are here and now the defenses will have to adjust accordingly again. Bill Belichick likes to stay a step ahead of the trends in the game, when the Patriots play their nickel and dime defenses, they frequently do so with extra safeties instead of cornerbacks. Part of the reason is in the AFC East, they play the Bills and Jets, two teams that run the ball extremely well. Safeties who take the place of linebackers in the big nickel defense have to be able to stuff the run and still be able to cover tight ends and running backs and the occasional slot receiver. Big safeties who can stuff the run and cover will become increasingly sought after as teams play more in their sub-packages than in their base defenses. What does this mean for New England? Well one last look at the coach’s film from the AFC Championship Game shows that at a bare minimum, they’re going to need a complimentary running game if they want to get back to the big game. They can’t rely on Tom Brady chucking the ball 80 percent of the time. Being one-dimensional against a very good defense like Denver’s hurt them twice in 2015. Brady took a beating in both games. With him turning 39 this season, they can’t afford to have him going down because the defense is just pinning their ears back. So while the Patriots haven’t valued the running back position in recent years, perhaps this is a good time, to reverse that trend a bit and spend the money and/or draft picks to get themselves a higher tier running back. They’ve proven they can throw it with the best of teams, but with a viable running game, not only will it make the passing game even more effective, it will limit the abuse your 39-year old QB has to take. There are some intriguing names out there both in free agency and the draft, several that can be had in the 2nd, 3rd and 4th rounds. The league is trending towards having better rushing attacks again. The Pats are already well equipped to stop those. Now they need to get to work on getting one of their own. 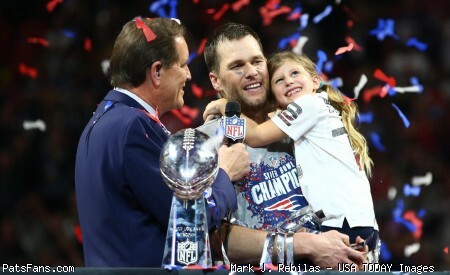 This entry was posted in Patriots Commentary, Patriots News and tagged 2015 NFL Post season, 2015 NFL Preseason, 2015 NFL Season, 2015 Patriots Season, Aaron Rodgers, Arizona Cardinals, Ben Roethlisberger, Bill Belichick, Brock Osweiler, Buffalo Bills, Cam Newton, Denver Broncos, Dion Lewis, Drew Brees, Gary Kubiak, Green Bay Packers, Kansas City Chiefs, Le'Veon Bell, New England Patriots, NFL, Patriots, Patriots running game, Peyton Manning, Running game trends, Seattle Seahawks, Super Bowl L, Tom Brady on February 12, 2016 by Steve Balestrieri. Check out our PatsFans.com, weekly ‘Patriots 4th & 2’ podcast. Russ Goldman, Derek Havens and Steve Balestrieri our featured columnists for the site, break down the games every week and bring some analysis to the latest news featuring both the Patriots and the NFL as well. In this episode, we looked back at the AFC Championship Game loss for the Patriots. We analyzed each quarter of the game, and also graded all the Patriots units along with the coaching staff. We also had another segment of “Around The League” and we ended with our early predictions for the Super Bowl. Be sure to listen in during the coming weeks; just because the Patriots playoff run in over, there is no off-season for them or us. We’ll bring our listeners the questions surrounding the team approaching free agency as well as looking at some players that the team may be interested in. We’ll look at some available free agents in the coming weeks as well as the upcoming 2016 NFL Draft. This entry was posted in Patriots Commentary, Patriots Podcast and tagged 2015 NFL Post season, 2015 NFL Season, 2015 Patriots, 2015 Patriots Playoffs, AFC Championship Game, Bill Belichick, Denver Broncos, Gary Kubiak, Josh McDaniels, Julian Edelman, New England Patriots, Patriots 4th & 2 podcast, Patriots Podcast, PatsFans.com, Peyton Manning, Rob Gronkowski, Tom Brady, Wade Phillips on January 29, 2016 by Russ Goldman. Belichick Snubbed Again: When the PFWA (Pro Football Writers of America) announced their annual awards, it was no surprise that Carolina Panthers coach Ron Rivera was named Coach of the Year, by the writers all over the nation who cover the NFL. While I have no issue with the job Rivera did this season, after all the Panthers went 15-1 and cruised thru the season I didn’t vote for him, (yes I am a member and did vote). My question is, does the unparalleled success by the Patriots in the Bill Belichick era make the fact that winning 12+ games every year become passé in the eyes of the rest of the league? In the last six seasons, the Patriots under Belichick have not won less than 12 games, they’ve hit that number the last four years in a row. In 2011, they won 13 and in 2010 they won 14. And yet every year the rest of the NFL falls all over themselves to crow about the job some other coach is doing. A record of 75-21 the past six seasons is outstanding in any circles, but today the Patriots are playing in their fifth straight conference championship game. With a win today, Bill Belichick would have more conference championships (7) than anyone since the 1970 merger breaking a tie with Don Shula. Belichick and Brady are appearing in their 10th conference championship together today. That’s 10 in 15 seasons together. That’s continued excellence my friends and it seems every year it is ignored. Mayo to IR, Snyder Activated: In another crushing end to a season following an injury, Jerod Mayo was placed on IR this week with a shoulder injury. His latest injury cut short his third season in a row less than a week before the conference championship. This may be his final season in a Patriots uniform unless he renegotiates his contract that will carry an $11,400,000 cap hit in 2016. Mayo had returned from two serious injuries in 2013 and 2014 where he played only six games in each and played in all 16 games this season. After starting a bit slowly, he turned things up a notch in the middle of the season and played much more solid until he faded a bit down the stretch. In his stead the team has activated LB Kevin Snyder from the practice squad. Snyder is the 5th member of the Rutgers Scarlet Knights to be a member of the New England this season joining Devin McCourty, Logan Ryan, Duron Harmon and Jonathan Freeny. He’s a guy that can contribute on defense and special teams. The 6’2, 240 pound Snyder was signed as an UDFA by the Lions and spent time with them and the 49ers on their practice squad before being released in October. He signed with the Pats practice squad before being signed to the active roster this week. Snyder ran a 4.58-second 40-yard dash at his pro day in March with a 7.09-second time in the all-important (to NE), 3-cone drill, 4.31-second short shuttle, 35-inch vertical leap and 9-foot, 9-inch broad jump. His signing is perfect timing for his checkbook; in lieu of his $6600 a week paycheck for being a member of the practice squad, he will get a $46,000 share of playoff money this week. Why You Should Feel Good about the Patriots Chances Today: Facing a tough Denver Broncos defense, ranked #1 in the NFL this season and on the road here are few reasons Pats Fans should feel confident. Tom Brady with both Julian Edelman and Rob Gronkowski in the lineup is 22-1 in his last 23 games. In those contests, Brady has completed 67.3 percent of his passes for 7322 yards, 64 TDs and just 13 INTs for a passer rating of 107. Facing the #1 ranked defense in the postseason, Brady has faced all three on the road and is 3-0. And NE won the Super Bowl in all three seasons. Slater Slater part of Football Royalty: Greg Garber of ESPN wrote a fantastic piece this week on Patriots ST captain Matthew Slater and his dad Jackie, long-time Rams OL and a member of the NFL Hall of Fame. The Slaters are #2 in the amount of Pro Bowls earned by a father son team with 12. They trail only the Mannings with 16. Slater was the slight, asthmatic kid with the thick glasses who everyone told would never amount to anything on a football field. But he learned a one-of-a-kind work ethic from his dad and never looked back. And Jackie is one proud dad of the player and man his son has become. Take the time and read this one…it is well worth it. By starting the game on Sunday for the Patriots, Tom Brady will stand alone in NFL with the most playoff games played in with 31. He currently stands tied with former Patriot Adam Vinatieri. Obscure stat of the day goes to Ryan Hannable of WEEI who found that when an opponent in the playoffs scores 19+ points, Peyton Manning’s record is 3-12. BTW Tom Brady’s record when scoring 19+ points in the postseason is 20-2. Even More Obscure Fact of the day goes to Alex Spier of the Boston Globe who researched the amount of times that Brady and Belichick face an opposing head coach what their winning percentage is. Whe-2n facing a coach for the seventh time…Brady and Belichick are 8-2. And they’ve faced Broncos HC Gary Kubiak six times, tomorrow will the seventh. You can’t make this stuff up. Bills Hire First Female Assistant Coach: Kudos to the Bills and Rex Ryan by hiring Kathryn Smith as their special teams quality control coach for next season. Smith has worked with Ryan for nearly the past decade and has earned her shot. Special teams quality control coaches normally break down film from the opponent and is considered a stepping stone job to ones with more responsibility. Ryan knows her and trusts her ability to get the job done. It wasn’t some kind of publicity stunt and she earned the right to move up the ranks. But not everyone is happy about it. Kevin Kiley a radio host from Cleveland made many misogynist quotes on his show that reveal he has more in common with 19th century thinking than those of today. Let Smith succeed or fail or her own accord. And let’s not jump to conclusions and act a fool for your 15 minutes. This entry was posted in Patriots Commentary, Patriots News and tagged 2015 NFL Post season, 2015 NFL Season, 2015 Patriots, 2015 Patriots Season, AFC Championship Game, Bill Belichick, Brandon LaFell, Chandler Jones, Danny Amendola, Denver Broncos, Gary Kubiak, Jabaal Sheard, Jackie Slater, Julian Edelman, Malcolm Butler, Matthew Slater, New England Patriots, NFL, Patriots, Patriots edge rushers, Peyton Manning, predictions, Rob Gronkowski, Tom Brady on January 24, 2016 by Steve Balestrieri. The Patriots need just one more win to book a trip to Santa Clara for Super Bowl L and a chance to win back-to-back championships. That is something that the mainstream media has been remiss in reporting all week. Considering it hasn’t been done since the 2003-04 Patriots with Tom Brady at the helm, it deserves mention. And not just a little. The Pats took care of business against the Chiefs and looked much more like the team that throttled the opposition early in the season than the team that limped into the postseason losing four of six. Tom Brady was especially sharp hitting 28-42 passes for 302 yards and two touchdowns, despite his team having a case of the drops. The Broncos had an impressive 23-16 comeback win against the Steelers. Down 13-12 midway thru the 4th quarter, Peyton Manning with a strong running game, led them to the eventual game winning touchdown and then added a field goal to put this one away. The defense held the potent Pittsburgh offense to just 16 points. Now it is time for our players to watch for this week. We’ve selected three players from each team that will be key to each team’s success. Julian Edelman: The Patriots sparkplug wide receiver returned after missing two months and it seemed that he never left. Edelman caught 10 passes for 100 yards. He set the tone right away as he caught a key third down pass from Brady to move the chains on the Patriots opening drive. Edelman’s presence ignites the short passing game that the Patriots lean on in lieu of the running game and no one does it better than Edelman. Prior to his injury the Patriots offense on third down was humming along at 50 percent (54 of 107). After his foot injury the team’s third down conversion percentage plummeted to 31 percent (34-108). During the first game in Denver without Edelman and Danny Amendola the Patriots were a woeful 2 of 13 on third down. Last week against the Chiefs, the Pats were 6 of 12 to get back to that 50 percent mark. Edelman and Rob Gronkowski are Brady’s favorite and most trusted targets in the Patriots passing game, how well they produce will go a long way in determining the outcome of this one. Key stat: With Edelman back in the lineup, his presence along with his ability to get open quickly gave Tom Brady the capability of getting the ball out of his hands incredibly fast. This helped the Patriots offensive line which has had issues with protection. On Brady’s 10 completions to Edelman he got the ball out of his hands in 1.57 seconds from snap to throw. On Gronkowski’s six receptions while lined up outside the numbers, Brady’s snap to throw times were an even faster 1.48 seconds. 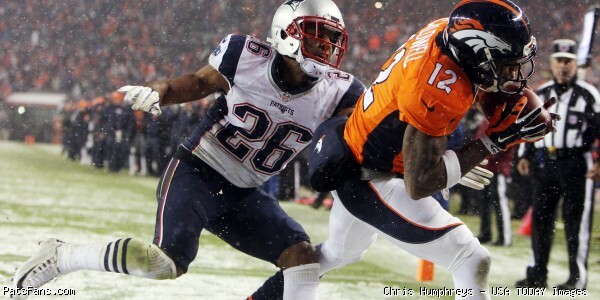 Chris Harris: The Broncos most athletic cornerback will be the player tasked with stopping Edelman on Sunday. He has the quickness and physicality needed to matchup with #11 and try to take away that underneath quick pass that the Patriots offense thrives on. Harris has been dealing with a shoulder injury which was characterized as a deep bone bruise. He played only on third downs against the Steelers, but was reportedly much better this week, with HC Gary Kubiak characterizing him as “ready for a full load” on Sunday. Harris himself said he felt “light years better” and was listed as probably for the AFCCG on the Broncos injury report Friday. His matchups with Edelman will be the story inside the story of the passing game of NE against the Broncos defense. Especially when Edelman slides inside into the slot. Key Stat: When moving inside in the slot, Harris held opposing QBs to a passer rating of just 44.6 in the 2015 regular season. Something will have to give here. This should be a good matchup between the two players. Rob Gronkowski: Gronkowski definitely benefitted from having Edelman back in the lineup along with Amendola. No longer could teams dedicate a fleet of players assigned to Gronkowski, he now had much more room to operate in and he made the most of his opportunities. On the Patriots opening drive, facing a 3rd and 13 from the KC 43-yard line, Gronkowski attacked the middle of the field and hauled in a 33-yard pass from Brady which set up the opening touchdown, also a pass to Gronkowski. Whenever the Patriots spread the Chiefs out with a four or five-man wide formation, Brady would look to Gronkowski if he were singled up in man-coverage and the results were plain to see. Six of Gronkowski’s seven receptions were outside the numbers and they resulted in two touchdowns. Brady targeted Gronk eight times against KC, completing seven for 83 yards and the pair of scores. Key Stat: In the first meeting in Denver, prior to being injured in the 4th quarter, Gronkowski had six catches for 88 yards and a touchdown. And that was without Edelman and Amendola in the lineup. In Brady’s last 23 games with both Gronkowski and Edelman available the Patriots are 22-1. And in those games Brady has completed 67.3 percent of his passes for 7322 yards with 64 TDs, 13 INTs for a passer rating of 107. That is how effective this trio is when they all are together. Peyton Manning: The Denver signal caller is entering the twilight phase of his career. He’s no longer the focal point of the offense but rather a game manager who has to rely on his running game to get the job done as injuries and age have taken their toll. The throws down the middle of the field aren’t as easy anymore as he now longer has the arm strength to test those passes which used to come so easily for him. But he still has his brain and that with his experience can still be a dangerous combination if the game is close at crunch time. He was patient against Pittsburgh as he didn’t try to do too much and would only take what the defense was giving him. But Denver’s defense kept the game a one-point affair late into the fourth quarter. How Manning and the offense respond if they fall down by more than that will bear watching on Sunday. Key Stat: Manning had his worst statistical year of his career in 2015 throwing just nine touchdowns and 17 interceptions. Dont’a Hightower: The Patriots linebacker is questionable for this game and his status as well as his production will be a huge key for the Patriots defense on Sunday. Hightower is the Patriots key player on their defense, he is a big run stuffer that explodes in the gaps and blows up plays at the line of scrimmage or in the backfield. He is also an underrated player in space that is very good at covering backs and tight ends close to the line of scrimmage. In the Pats front seven, Hightower is the anchor and Jamie Collins is the playmaker. The two give New England a very talented pair that work seamlessly with one another. One other aspect for Hightower’s game is his ability to blitz up the A-gap. Both he and Collins have been quite adept at that and with an immobile Manning in the pocket, that could be something to watch for a couple of times on Sunday. Key Stat: In the first meeting between the two teams in Denver, the Broncos rushed 15 times for 43 yards (2.9 yard avg), when Hightower was on the field. After he left with an injury, Denver ran 15 times for 133 yards (8.8 yard avg), and three touchdowns. Derek Wolfe: The Broncos interior defensive lineman played a big role in the earlier meeting back in November and may once again be one of the key players to watch in this conference championship. With Brady attempting to the get the ball off quickly, it negates much of the rush that the Broncos can bring from the edge. But Wolfe can bring the pressure from the inside and not allow Brady to step up in the pocket. He and Malik Jackson in the interior may play a bigger role in this game than their more well-known teammates in Von Miller and DeMarcus Ware in disrupting the Patriots passing game. Wolfe had a big year in 2015 with 6.5 sacks, all in the last eight games after missing the first four games of the season, serving a suspension for violating the league rules on PEDs. He just signed a four-year contract extension worth $36 million with 17.5 of it in guarantees. Key Stat: In the first meeting Brady had Gronkowski in single coverage with Miller, a huge mismatch, and as Gronk was breaking free with plenty of room to run after a catch, Wolfe burst thru a double team and was able to get the sack. It was one of those plays that turned field position as the Patriots instead of being near midfield, were forced back around the 10-yard line. This entry was posted in Patriots Commentary, Patriots News and tagged 2015 NFL Post season, 2015 NFL Season, 2015 Patriots, 2015 Patriots Season, AFC Championship Game, Bill Belichick, Brandon LaFell, Chris Harris, Danny Amendola, DeMarcus Ware, Denver Broncos, Derek Wolfe, Gary Kubiak, Jabaal Sheard, James White, Julian Edelman, Malcolm Butler, New England Patriots, NFL, Patriots, Patriots edge rushers, Peyton Manning, Rob Gronkowski, Tom Brady, Von Miller on January 23, 2016 by Steve Balestrieri. 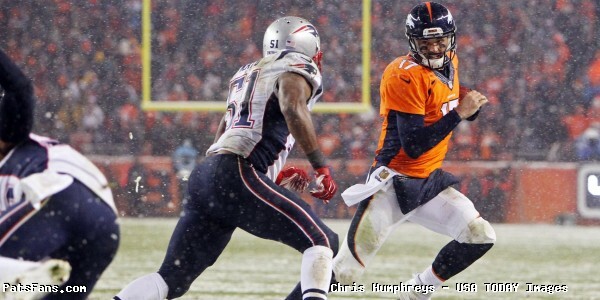 Patriots, Broncos Keys to the AFCCG, Who Has the Razor’s Edge? The New England Patriots need one more win to get back to the Super Bowl with a chance to repeat as champions. But to do so, they face a familiar nemesis in the Denver Broncos. The Patriots defeated the Kansas City Chiefs in the Divisional Round 27-20 as Tom Brady threw for 302 yards and a pair of touchdowns to Rob Gronkowski. 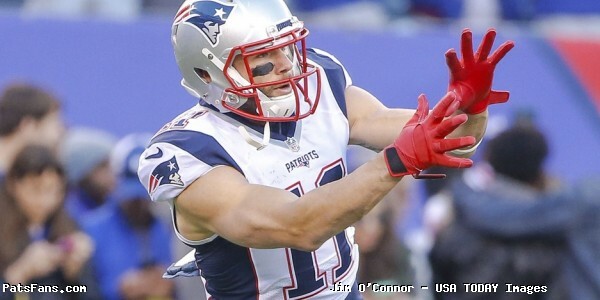 The team welcomed back Julian Edelman and his presence ignited the short passing game. Edelman missed the final seven games but had 10 catches for 100 yards on Saturday. The Broncos made a big fourth quarter comeback and defeated the Pittsburgh Steelers 23-16. Trailing 13-12, it appeared as if the Steelers were driving for clinching touchdown when a fumble turned the game around. The Broncos scored the next 11 points in the final four minutes to pull away for the win. We here at PatsFans.com are continuing our playoff edition of the “Razor’s Edge” column in 2016 to give a quick break down on some of the key match-ups of the game and what you can look for in how the game plays out. The Patriots and Broncos will meet for the 51st time in their history, the most the Patriots have faced an opponent that has been outside their division. The Patriots never seem to play their best football in the altitude there as they’ve been 9-20 in Denver since the early days of the NFL. There was one stretch from 1984 -1998 that the teams met 11 times, nine of them in Denver and the Pats lost them all. The two teams met in November in Week 12 with the Broncos taking a 30-24 win in OT. Here is a look at some of the key match-ups and who holds the Razor’s Edge. This entry was posted in Patriots Commentary, Patriots News and tagged 2015 NFL Post season, 2015 NFL Season, 2015 Patriots Season, AFC Championship Game, Aqib Talib, Bill Belichick, Brandon LaFell, Brandon Marshall, C. J. Anderson, Chandler Jones, Chris Harris, Danny Amendola, DeMarcus Ware, Demaryius Thomas, Denver Broncos, Derek Wolfe, Dion Lewis, Emmanuel Sanders, Gary Kubiak, Jabaal Sheard, Julian Edelman, New England Patriots, NFL, Owen Daniels, Patriots, Patriots edge rushers, Peyton Manning, Pittsburgh Steelers, predictions, Rob Gronkowski, Rob Ninkovich, Ronnie Hillman, Shaq Barrett, T.J. Ward, Tom Brady, Von Miller, Wade Phillips on January 22, 2016 by Steve Balestrieri. The Patriots travel out to the Mile High City in Denver to take on a familiar opponent, the Broncos in the AFC Championship Game for the second time in three years. Both teams won in the AFC’s Divisional Round while at home. The Broncos came back from a 4th quarter deficit with 11 points in the final four minutes to beat the Pittsburgh Steelers 23-16 on Sunday evening. Capitalizing on a recovered fumble where it looked like the Steelers were about to put the game away, they drove for a go-ahead touchdown and then added a field goal after the Steelers turned the ball over on downs. The game is scheduled for 3:30 p.m. and will be televised by CBS and will have their announcing crew of Jim Nantz and Phil Simms on the call. It will also be carried by the Patriots flagship radio station 98.5 FM the SportsHub with Bob Socci and Scott Zolak. Tickets will only be sold to those with a billing address in the Rocky Mountain region, including Colorado, Montana, Nebraska, New Mexico, South Dakota, Utah, western Kansas and Wyoming. Sounds like the good folks in Denver are worried at seeing a ton of Patriots fans for the game. Forget the Hype or Ignore the Noise in this one: The mainstream media is falling all over themselves in trying to make this “Brady vs Manning XVII” or some other nonsense. As if the question is still an open one…that book was closed long ago. Manning is a complimentary piece now and the offense no longer revolves around him airing it out 40-45 times a game. If truth be told, Bill Belichick and the Patriots would love nothing more than to force Manning into HAVING TO throw all game long. That is a game the Patriots would feel they would be best served to win. The legacy pieces for Manning were already well into play on Sunday as the lead-in to the Divisional Game was less about Pittsburgh and Denver and more about hailing the conquering hero. Since Saturday, think back how many times you’ve heard, “With a win on Sunday, Tom Brady will have the opportunity to win back-to-back Super Bowls.” In fact, no one has done it since…Brady did in 2003 and 2004. And we haven’t heard it in the mainstream …once. We have seen from multiple sources that Monday was the 1-year anniversary for Deflategate. One thing you won’t hear on Sunday that it will be 30-day anniversary of the HGH story released by Al Jazeera that Manning played a part in, especially from his buddy Nantz at CBS. But back to Manning, his arm even in the near 50 degree temps on Sunday still struggled to hit those outside throws with any velocity. Good news for Denver has the extended weather forecast at being near 50 again on Sunday. Manning remains a very smart signal caller and has the experience to recognize a lot of pre-snap reads that can lead to an audible at the line. Forget the regular season numbers, Denver is a running team now: The Broncos were a poor running team until Manning was sat down and Brock Osweiler brought in. That brought wholesale changes to their formations and the commitment to running the ball that has paid dividends. While the Broncos averaged 107.4 yards rushing per game on the season, those numbers were much better in the second half of the season. During six of the last seven games Denver has rushed for more than 100 yards. During the final seven games the Broncos averaged an impressive 134.8 yards per game on the ground. If not for the Oakland game where they were stymied for just 34, that number would have been 151.6. Coach Gary Kubiak’s zone blocking scheme along with running backs Ronnie Hillman and C.J. Anderson have excelled for Denver down the stretch. This will be a key area to monitor as the game moves closer. During the first meeting prior to Dont’a Hightower going down with an injury, Denver rushed 15 times for just 43 yards, a 2.9-yard average per rush attempt. After Hightower went out Denver rushed 15 more times for 132 yards, an 8.8-yard average per rushing attempt with three touchdowns including Anderson’s 48-yard scamper in OT. The big Patriots linebacker will be a key cog in stopping the run this week. Denver’s Defense Will Look Different with Ware on Sunday: Missing in the first matchup between the two teams was bookend pass rusher DeMarcus Ware who was out with a back ailment. He and Von Miller led the Broncos pass with 7.5 and 11 sacks respectively as the team was tops in the NFL in that category with 52. They also get a good push from interior DL Derek Wolfe who notched 5.5 sacks of his own in just 12 games this season. Wolfe was suspended for the first four games of the year for violating the league’s rules policy on performance enhancing drugs and then parlayed that into a four-year contract extension worth $36 million with $17 million guaranteed. Money well spent. Denver had the fourth overall defense in terms of points allowed with 18.5 in 2015, was third best against the run allowing only 83.6 yards per game but was #1 in terms of total yards (283.1) and Yard passing (199.6). Wade Phillips unit has been the cornerstone of this team all season. The secondary is deep and active, led by Chris Harris, Aqib Talib as well as safety T.J. Ward, the hard-hitting presence who plays right up to and many times over the line. While they didn’t generate a ton of interceptions, the secondary has the ability to blanket opponents and shut them down, coupled with their pass rush. Special Teams Was a Big Factor in Win Over Pittsburgh: While many will point to, and rightfully so as the Steelers fumble as the turning point in that game Sunday, the Broncos STs delivers a large share of the credit as does the failure of Pittsburgh’s for keeping that game close. Kicker Brandon McManus single-handedly kept the Broncos in the game with four field goals and later put the game away with a fifth. He was all the scoring the Broncos would get for 23 consecutive playoff drives until the late touchdown on Sunday. While the Steelers punting unit couldn’t deal with the gusty winds blowing in Mile High, Britton Colquitt had no such issue and won the battle of field position easily. Denver’s coverage units are very solid and their punt coverage team allows only a 6.1-yard average. Who can’t forget the muffed punt by the Patriots’ Chris Harper in November that Denver was right on top of and it turned a 21-7 Patriots lead into an eventual loss. Their punt returners Emmanuel Sanders as well as Omar Bolden are dangerous. Bolden gashed the Steelers for a 42-yard punt return on Sunday that led to a field goal. But he hurt his knee on Sunday and may not be available for Sunday’s game. The Patriots STs will have their hands full on Sunday. Broncos Solidify Offensive Line Just in Time for Playoffs: Denver much like New England has had injuries to their offensive line. They’ve had to mix and match with their backups and the results weren’t always the best. But on Sunday the debate as to who would start for the Broncos at right tackle was answered…and emphatically as Michael Scoffield not only started but played all 74 offensive snaps against the Steelers. While he got flagged for one holding call, he was solid in the game and did a good job in the running game. Left guard Evan Matthis who was hurt and coming off the bench down the stretch for the last three games of the season, also started and played all 74 offensive snaps. But a question that does remain is where is Vernon Davis? The tight end who John Elway traded for has had issues learning the offense and played in just 11 snaps during the final two regular season games. Against Pittsburgh, Davis played only a single snap signaling that he is now the third TE on the depth chart behind Owen Daniels and Virgil Green. While there’s still a chance that we’d see Davis against New England, it seems that this move was one of those low-risk, high-reward moves that just didn’t pan out. This entry was posted in Patriots Commentary, Patriots News and tagged 2015 NFL Post season, 2015 NFL Season, Aqib Talib, Bill Belichick, Brock Osweiler, C. J. Anderson, Chris Harris, DeMarcus Ware, Denver Broncos, Derek Wolfe, Emmanuel Sanders, Gary Kubiak, New England Patriots, NFL, Patriots, Peyton Manning, Rob Gronkowski, Ronnie Hillman, T.J. Ward, Tom Brady, Von Miller on January 19, 2016 by Steve Balestrieri. Patriots – Broncos Key Matchups, Who Has the Razor’s Edge? 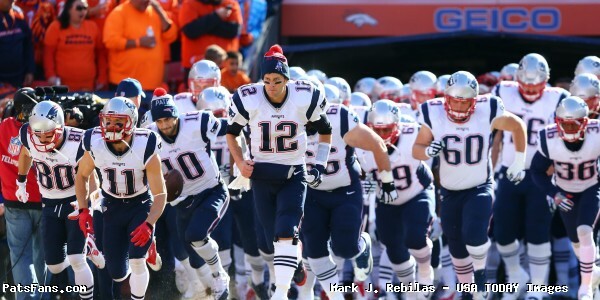 The New England Patriots head out on the road to face the Denver Broncos on Sunday Night Football. This will be back-to-back night games on national television for the Pats having come off a short week and playing on Monday night. 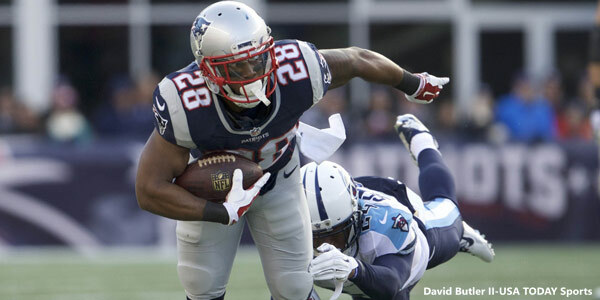 The Patriots (10-0) beat the Buffalo Bills 20-13 on Monday Night Football. Tom Brady threw for 277 yards and a touchdown despite being hit on 50 percent of his throws and missing many of his offensive weapons. The defense held Tyrod Taylor in check all night long and allowing the Bills to rush for only 3.1 yards per attempt. The Broncos (8-2) beat the Chicago Bears 17-15 on the road as QB Brock Osweiler starting in lieu of Peyton Manning had a very successful debut throwing for 250 yards and a pair of scores as the defense stuffed the Bears in the red zone all game long. The Patriots and Broncos will meet for the 50th time in their history dating back to the early days of the AFL with Denver holding a 28-21 all-time series lead. Denver has traditionally been a tough place for the Patriots to win where Denver holds a sizeable 19-9 advantage including three playoff wins. The last meeting between the teams was in November of 2014 with the Patriots taking a 43-21 win in Foxboro. This entry was posted in Patriots Commentary, Patriots News and tagged 2015 NFL Season, Aqib Talib, Bill Belichick, Brandon LaFell, Brock Osweiler, Chandler Jones, Chris Harris, Danny Amendola, DeMarcus Ware, Demaryius Thomas, Denver Broncos, Dion Lewis, Emmanuel Sanders, Gary Kubiak, Jabaal Sheard, Julian Edelman, LaGarrette Blount, Malcolm Butler, New England Patriots, Patriots, Patriots edge rushers, Pats, Peyton Manning, picks, predictions, Rob Gronkowski, Rob Ninkovich, Social Media, T.J. Ward, Tom Brady, Von Miller on November 27, 2015 by Steve Balestrieri.